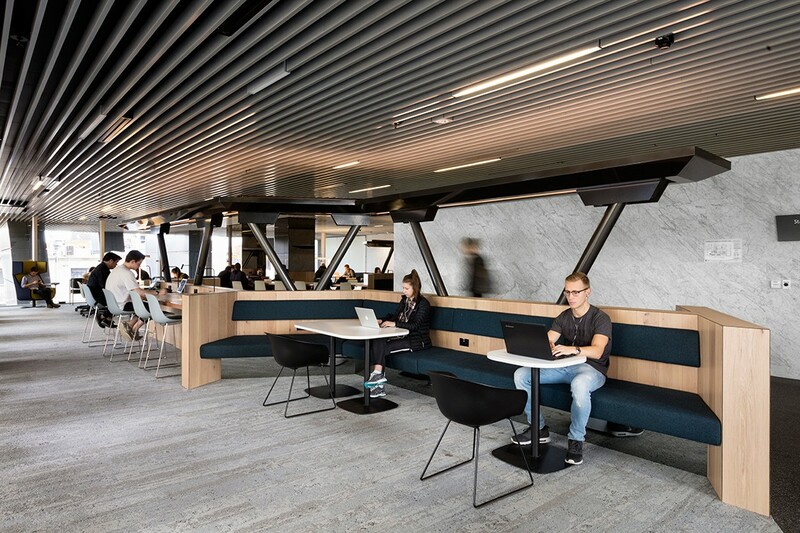 In its design of Melbourne Uni’s new Faculty of Business Student Space, DesignInc has defined a new benchmark in education design, led by how we are starting to think about our workplaces – customisation. Sick of hearing about agile? Join the club. It’s kind of become one of those generic buzzwords that every commercial designer seems to have on their website, but doesn’t really get what it means, or more importantly – how to execute it. Then again, there are always those special few that continue to think about how concepts such as agile might spill over into other typologies. 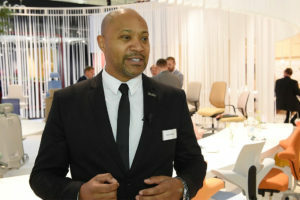 The biggest buzzword thrown around this year’s NeoCon was ‘customisation’ – specifically, the idea that the future of agile industrial, interior and architectural design should be led not only by giving people options to work where and how they want, but to look at how they feel when they do. Here, ‘personalisation’ and ‘customisation’ are what we should all be thinking about in our design output. 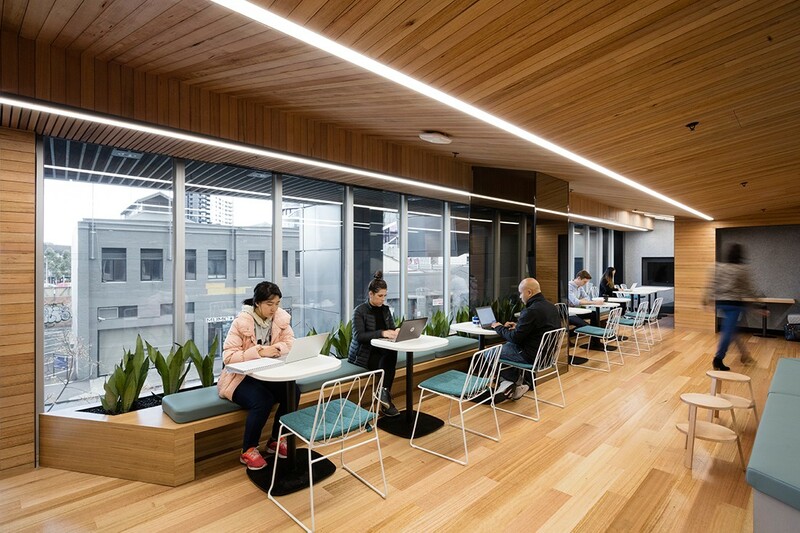 Some, however, were already ahead of the game, as with DesignInc and its latest project for the University of Melbourne’s School of Business Faculty. 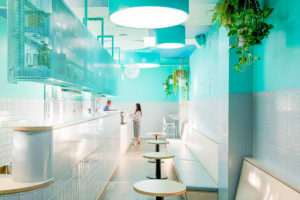 The brief was to reimagine the space and how it could work better for the personal needs of each individual student to get the most from their learning experience. “The existing spaces, split across six levels, were underwhelming and lacked the vibrancy of equivalent areas in other faculties. The challenge was to achieve University benchmarks and provide high-quality learning environments for undergraduate and postgraduate students. 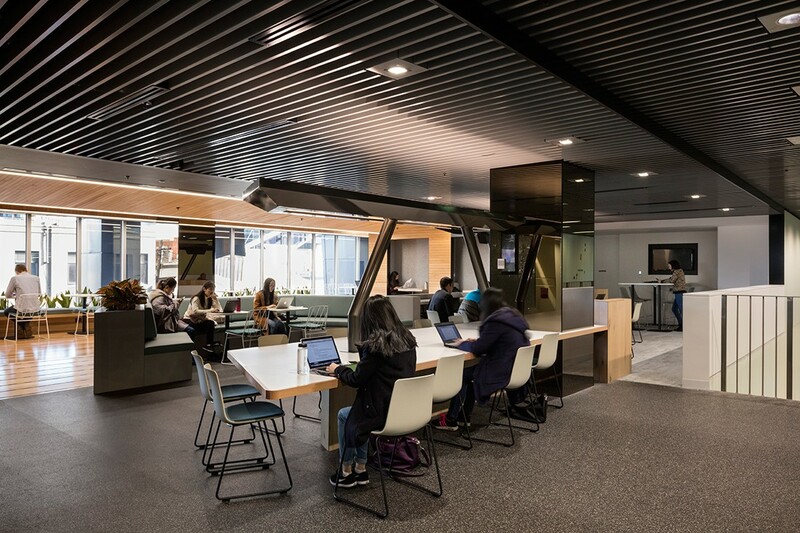 The new spaces needed to accommodate diverse, technology-driven learning and retain the existing 5-star Greenstar rating. 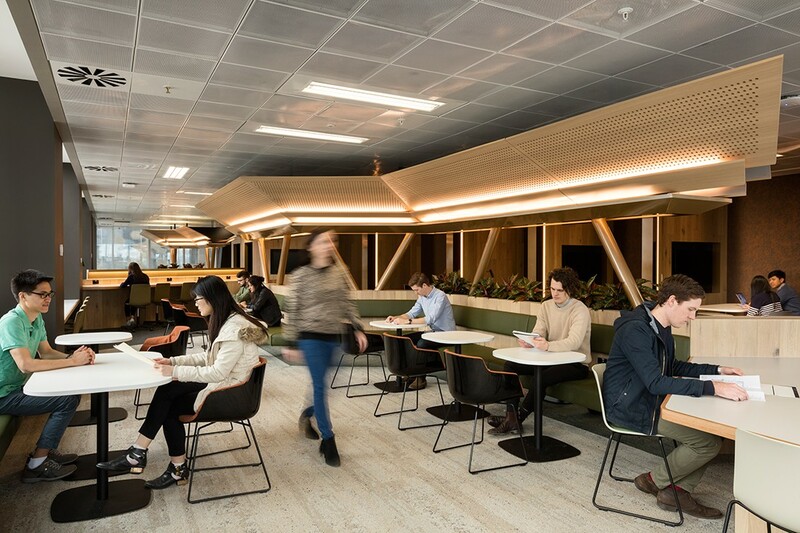 The re-visioning of student study spaces in The Spot aims to maximise the student experience within the precinct through the creation of dynamic, collaborative lounges for the Faculty of Business and Economics, not unlike you would find in an agile workplace. 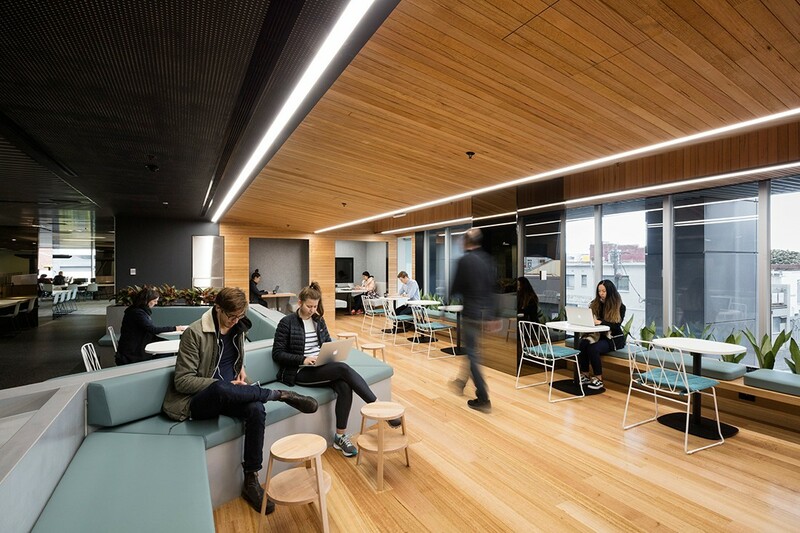 The spaces provide vibrant hubs for learning and nurturing social connections, bridging the gap between university and industry and preparing students for the workforce,” say DesignInc project leads Jane Sayers, Christon Batey-Smith, Sally Brincat. 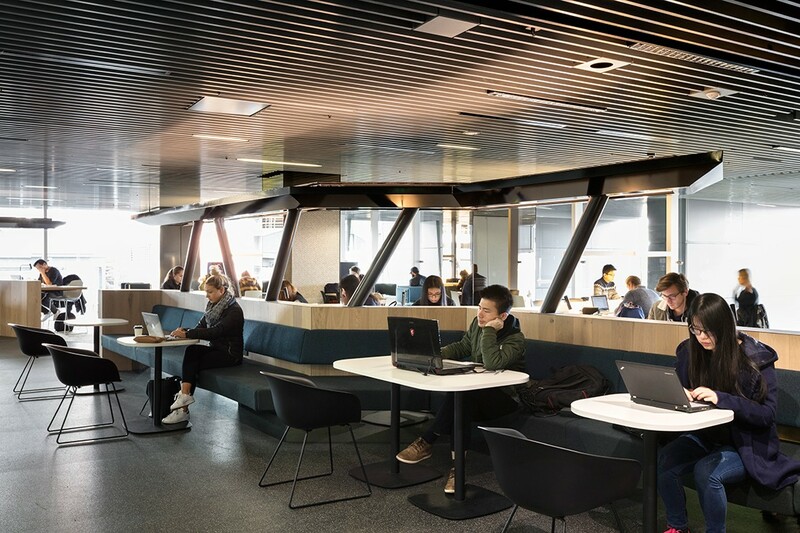 Here, new study spaces were crafted over six levels of an existing 5-Star Green Star rated building, with a focus on expanding sustainability benchmarks. 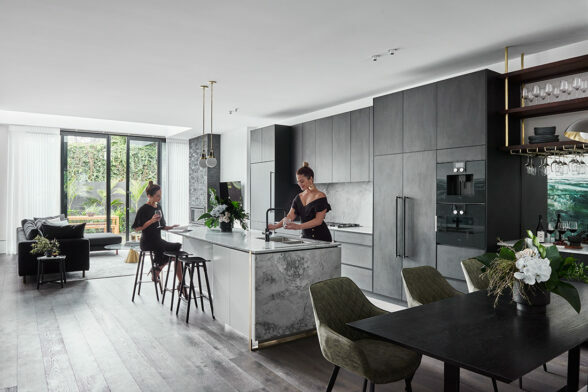 Over the six levels, durable new landscapes were created for each flow using tactile settings of timber joinery, hardwired with technology, and a range of light sources. Access to natural light and outlooks was calculated with a gradient of seating settings for a tapestry of view effects across the landscapes. 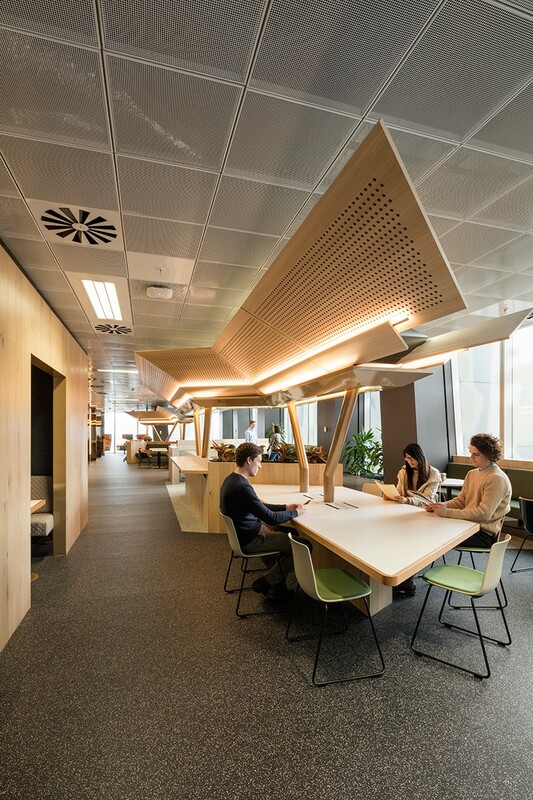 The new multifunctional space was designed for teaching, functions, events and executive education. 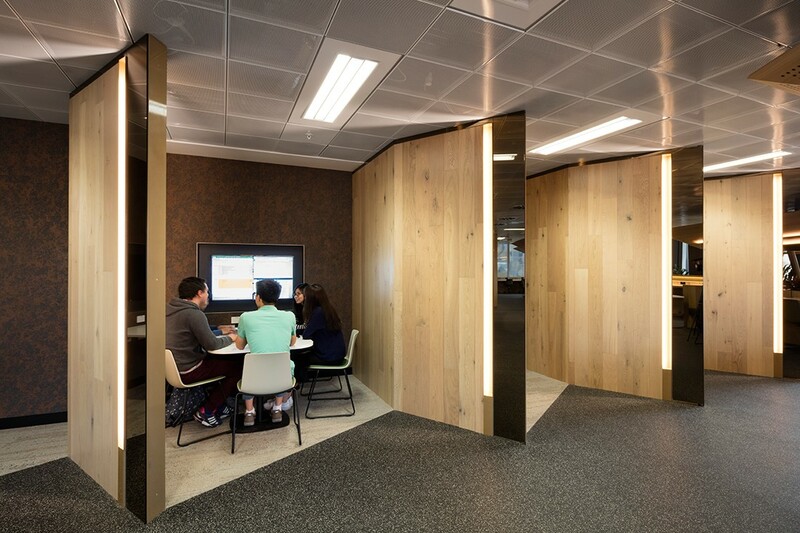 Separate lounges for undergraduates and postgraduate students are all technology-enabled with a variety of study settings to support different work modes and collaboration, as are the postgraduate project rooms. 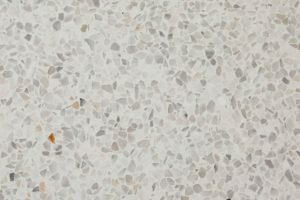 Additionally, the new IT-rich spaces support collaborative and independent study for both undergraduate and postgraduate students, in a nature-inspired setting of connected ‘landscapes’, rendered in earthy materials and hues. 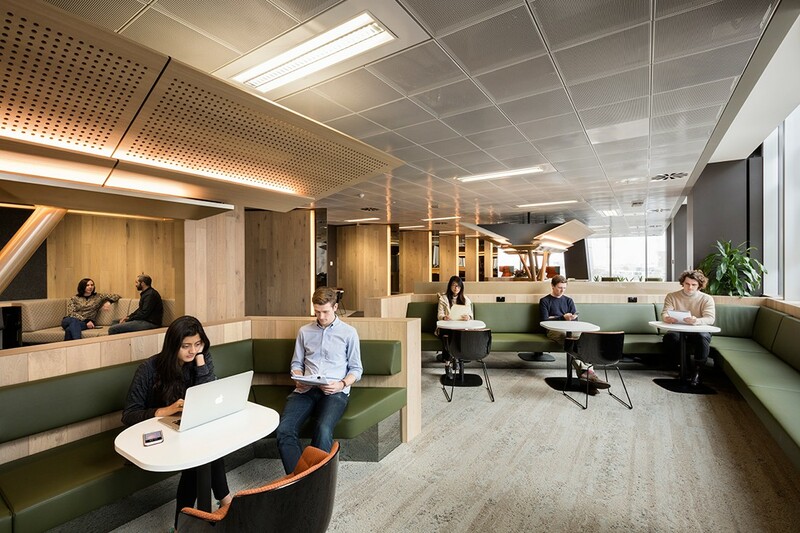 The flow from undergraduate to postgraduate spaces is cleverly communicated through materials and form progressively, reflecting contemporary business workplace experiences. 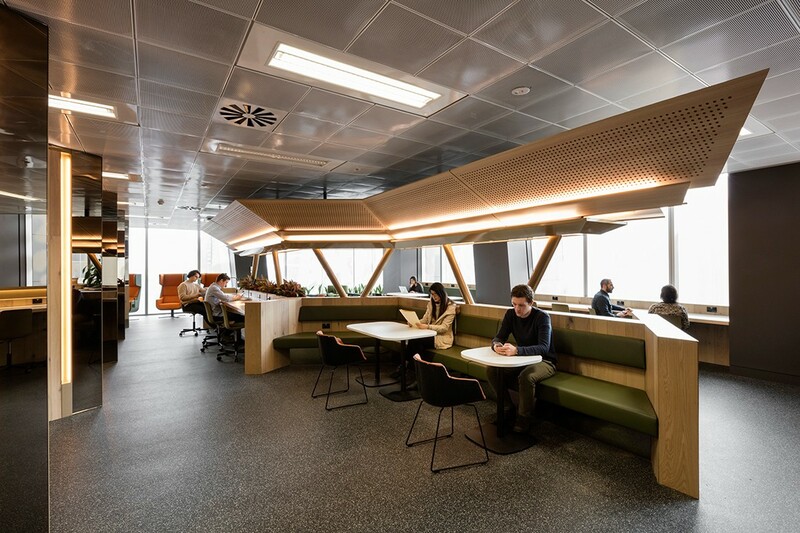 Natural materials, particularly the extensive use of timber, have created a new benchmark in study spaces for the faculty. 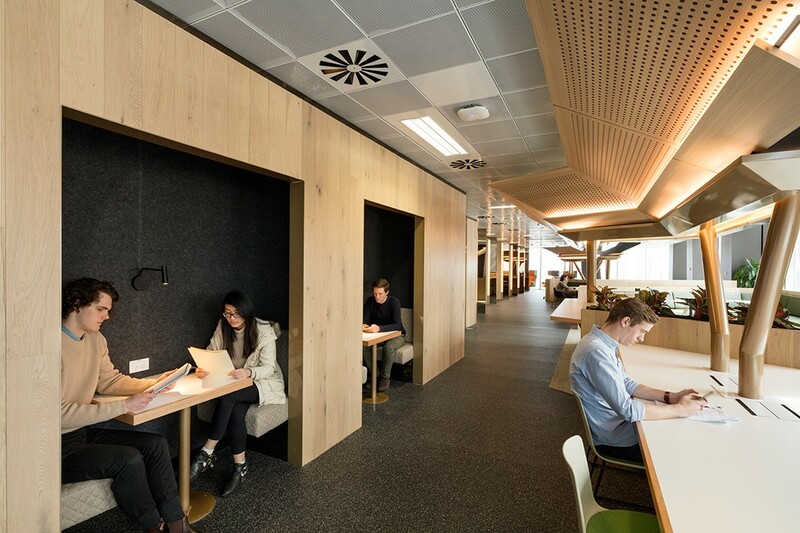 Accessible 24/7, the student spaces in The Spot – once under-utilised — are now hubs for group and simple study. And finally the concept of the existing façade – filtered light in a forest clearing – is strengthened with the new interior planning, that is based on the fluid dynamics of swirling eddies – for student flows around obstacles. In responding to and delivering on the brief, DesignInc didn’t want to get too verbose or over-complicate things. 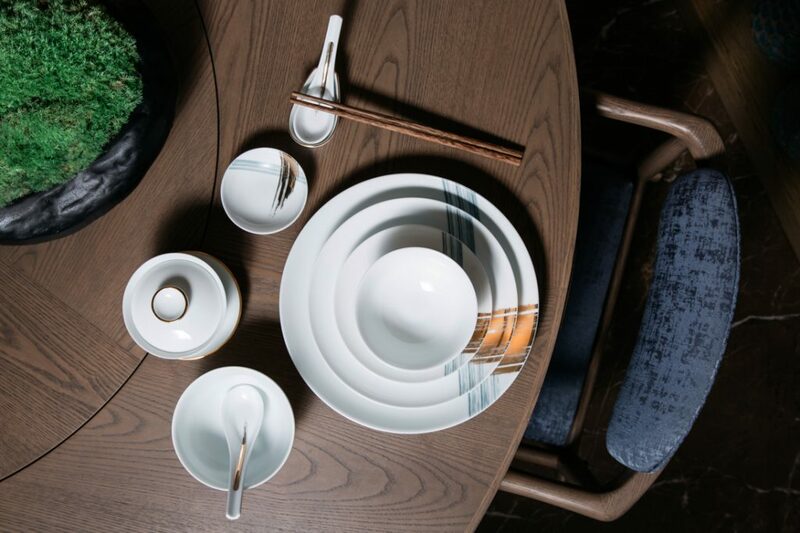 “Simplicity lies in a simple expression, a single strong gesture – like the way water ebbs and flows around landforms in a stream. A key driver was to define and create opportunities to support the pace of student life. 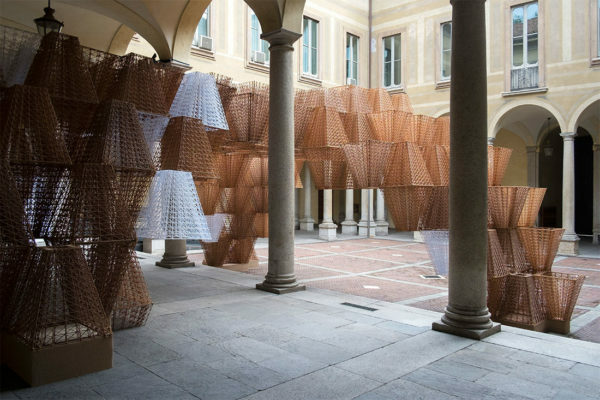 The spatial organisation is inspired by the ebb and flow of water around natural landforms, creating metaphorical connections to the ebb and flow of students interacting with the spaces and each other,” says the team. 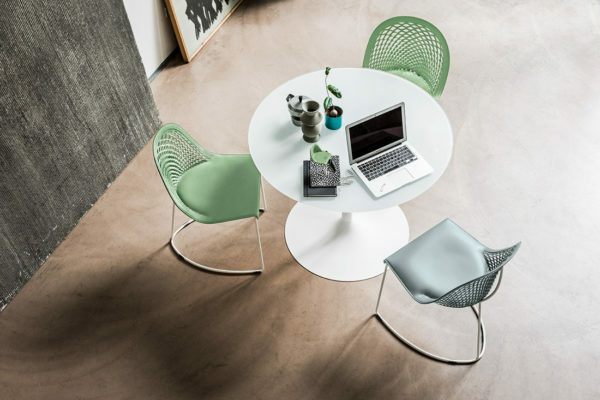 This was achieved by using biophilic (design theory in the natural world) design principles, where the student spaces are designed to create environments that promote creativity and learning, while also decreasing stress. The landforms support a layer of natural vegetation at eye level. Overhead dragonfly-like canopies incorporate acoustic absorption and lighting and provide a sense of refuge and shelter within the space. 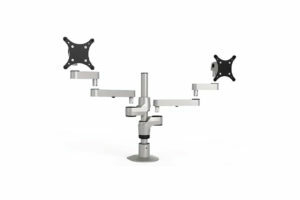 The dynamic canopies break the linear scale of the existing floorplate and the existing ceiling plane that was unable to be altered. 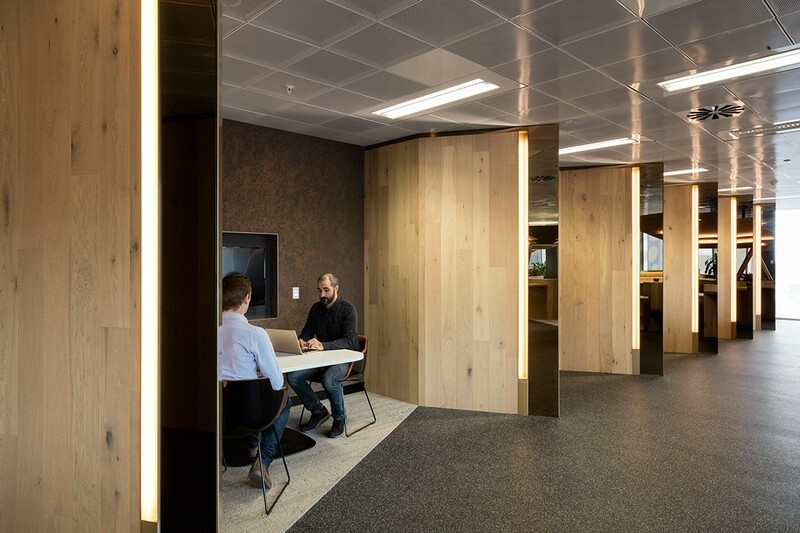 A palette of timber, natural colours, and reflective surfaces foster a warm and inviting atmosphere encouraging students to linger and spend time in the invigorated spaces. This creates vibrant hubs for students to collaborate and come together, work and share knowledge. DesignInc concludes by noting that it is the responsibility of all designers in this sector to “ensure that the interpersonal and social impacts of learning are achieved by providing spaces that are human centred and support both social connectivity as well as digital connectivity.” Lesson learnt! 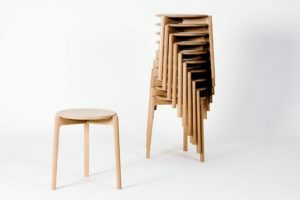 Want more education design inspiration? 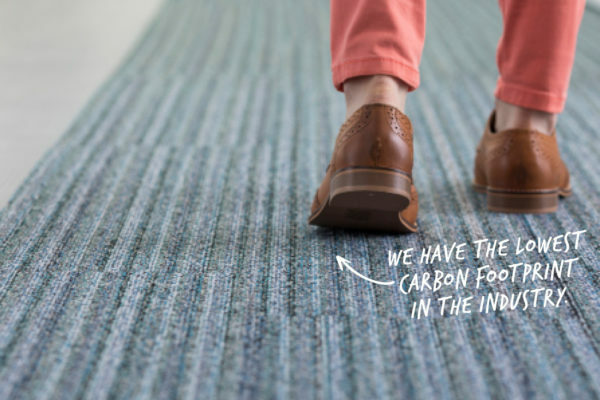 Take a look at our overview of what’s happening in the space. 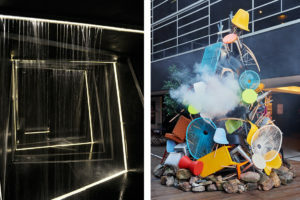 Keep up to date with the latest from the design industry. Sign up for our newsletter.